I'm on a mission. It's not something I consciously set out to do, but it seems that now my knitting is competent, there are new things that I need to learn which inevitably lead me to I realise that I don't know enough about construction, fabrics and design to do much more than follow patterns I think will be suitable and hope for the best. 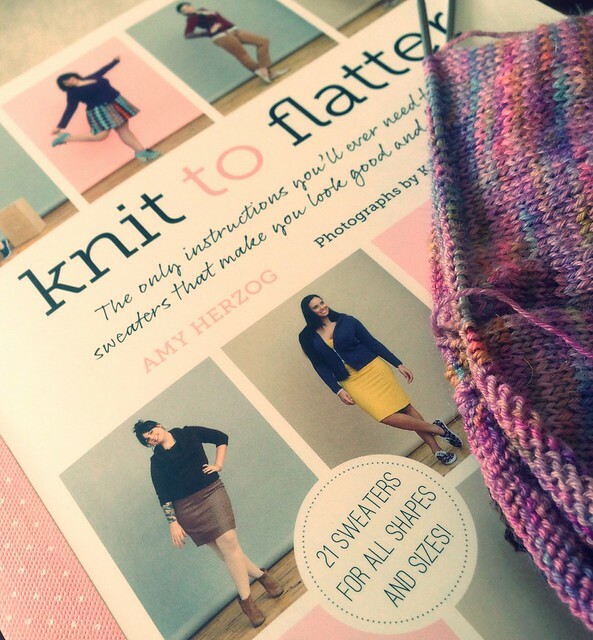 When I spotted the Knit to Flatter book on Instagram, it sounded perfect and was ordered right away. I haven't read very much of it yet so I can't write a review, but so far it's great. It talks about how to analyse your shape to identify which design elements will accentuate the best attributes and balance out any disproportionate bits and how to customise patterns to suit and fit. These are skills which I think will be invaluable as I am short with a curvy figure and a waist that is usually lost under clothing. Author and designer Amy Herzog also teaches this content in the Knit to Flatter Online class and I have added it to my Craftsy wishlist. Which leads me onto the reason I haven't started a new novel this week - I've been continuing the Pattern Writing for Knitters class in the evenings, which I am enjoying very much. And so onto my knitting - I completed one new little project at the weekend, which you can see on Friday, and am back to knitting those "Deja Vu" socks (so called because this is the 3rd incarnation of this lovely A Stash Addict yarn). You may notice the absence of the other project I wrote about last week and that's because I still haven't decided whether to make it an eyelet-less version or to rip back those rows. It's hibernating for a little while. It's always good to learn something new. :-) I was just thinking about taking part in blog wee (your other post)k. But no, I don't. It's too much pressure at the moment. There is too much going on already. I'm excited to hear your thoughts about the Knit to Flatter Craftsy class. I am a Craftsy addict, but should probably finish the eight or so classes I've already signed up for before adding another one to the mix! This book is definitely on my wish list, too! I adore Amy Herzog's patterns. I think she has a beautiful understanding of fit-flattery. I hope the book helps provide you with some new tools. Sounds like a great book. I'm still struggling with getting garments to fit, never mind flatter. Maybe if I was more adventurous and cast something on and gave it a go? Ah well, socks it is for me. Thanks for your comment on my blog; and yes, they're blackthorn needles. I have them in three sock knitting sizes and just LOVE them. Do let us know how this book is. It's so yummy to see fresh, new books on the market but I have so many that haven't been used. I'm being good altho I do wanna sneak a peek at the used bookstore to see what knitting books are there. I never feel brave enough to try to alter a pattern to suit me, so maybe I should look into a book to teach me! I'm dying to hear what you think about the book - I bought and printed her fit to flatter series of blog posts which I guess forms that basis of this book ... it is fantastic. This has patterns too though doesn't it?! I've beeing contemplating joining the knit to flatter class, but I've still got 3 that need attention, I'll be keeping an eye on the blog for the book review. Have heard from several podcasters that this is a great book. Looking forward to your review, as it seems to be expert knitting (which I do NOT do)!